Hemangiopericytoma, first described and named by Stout and Murray in 1942,1 is an uncommon spindle-cell tumor that pathologically displays a thin-walled vascular branching pattern. These tumors are derived from mesenchymal cells, can be benign or malignant, and occur more commonly in the lower extremities, but they have been described in the liver, pelvis and retroperitoneum. In an attempt to standardize nomenclature, some pathologists use the CD34, CD99, epithelial membrane antigen, GLC2, and smooth muscle actin stains to identify asubset of these tumors as solitary fibrous tumors. Only 23 reported cases of primary liver hemangiopericytoma have been reported in the English literature.2 Both sexes in their sixth decade are affected equally. Clinical features include abdominal fullness and mass, weight loss, vomiting, diarrhea, fatigue and hypoglycemia.3 Information about the radiographic characteristics of hemangiopericytomas is scant. Fuksbrumer et al. described heterogenous enhancement on MRI and CT due to differential enhancement of the admixed cellular and collagenous components.4 Other anecdotal cases report areas of necrosis and calcification; these were not noted in our patient. 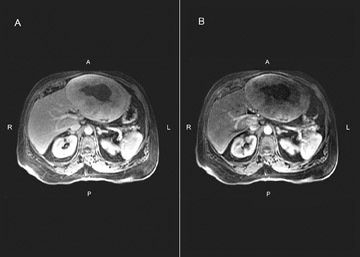 Although imaging features may suggest the diagnosis of a primary hemangiopericytoma of the liver, other benign or malignant hepatic tumors such as sarcoma, leiomyoma and inflammatory pseudotumor of the liver may have similar features.4 As resection of these tumors may result in long term survival, one should avoid the misdiagnosis and nihilism associated with hepatocellular carcinoma. Following primary excision, there is little role for radiation or chemotherapy. Stout AP, Murray MR. Hemangiopericytoma: A vascular tumor featuring Zimmermann’s pericytes. Ann Surg. 1942;116:26-33. Ji Y, Fan J, Xu Y, et al. Solitary fibrous tumor of the liver. Hepatobillary Pancreat Dis Int. 2006;5:151-153. Moran CA, Ishak KG, Goodman ZD. Solitary fibrous tumor of the liver; A clinicopathologic and immunohistochemical study of nine cases. Ann Diagn Pathol. 1998;2:19-24. Fuksbrumer MS, Klimstra D, Panicek DM. 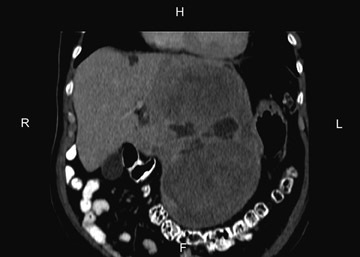 Solitary fibrous tumor of the liver: Imaging findings. AJR Am J Roentgenol. 2000;175:1683-1687. Primary hemangiopericytoma of the liver. Appl Radiol.